Thread: Carbine length triangle handguards? Was there ever carbine length triangle handguards? I think I have seen aftermarket new ones. Did Colt ever put them on carbines? If so, are they available anywhere? After searching around a bit, I don't think that there was. All of the ones that I have seen are cut down full size ones or aftermarket ones. Aftermarket only, I have several that I used on my retro-looking carbines. I have seen a few pictures that were field made in Vietnam. I use them to build light weight carbines for my grandsons to shoot. There are a few on the market that do not have a heat shield. I have a few with full stocks on them also. I like them best. Here are a few of what I have. Note: I put together the one in the first picture several years ago with all commercial parts, it was not easy when I put it together. Now you can get all the commercial parts much easier and the cost to do it is quite a bit cheaper. I have started pulling off the original Colt parts and replacing them with commercial parts. The value of original Colt parts has gotten very high to collectors and a few States that can only have rifles/carbines built with pre-ban era parts. My plan it to put together some Kits and sell them later. (Maybe next year). I did do this earlier this year for some all Colt parts thru a dealer (no lower receiver) and he sold them in a couple days, so there is a very good market for original parts. Last edited by Planning; 10-30-2018 at 08:48 AM. What about a Colt 607? Yes, You are correct. I have a couple I have started, There were some trials in Vietnam. It didn't work out so well. I have a couple of them I have started. I would have to short barrel them to finish them and add a moderator. I have seen pictures using the 603 upper or the 604 upper. See the second picture in my post above, it is one of them I started. Last edited by Planning; 10-31-2018 at 05:45 AM. I had two, That I picked up in the early 70's ... Lent one to a "friend" so he could make a mold, And make some from fiberglass... (Well, I never seen that one again..) The other one ended up on on this. Last edited by Harms Way; 11-02-2018 at 10:12 AM. 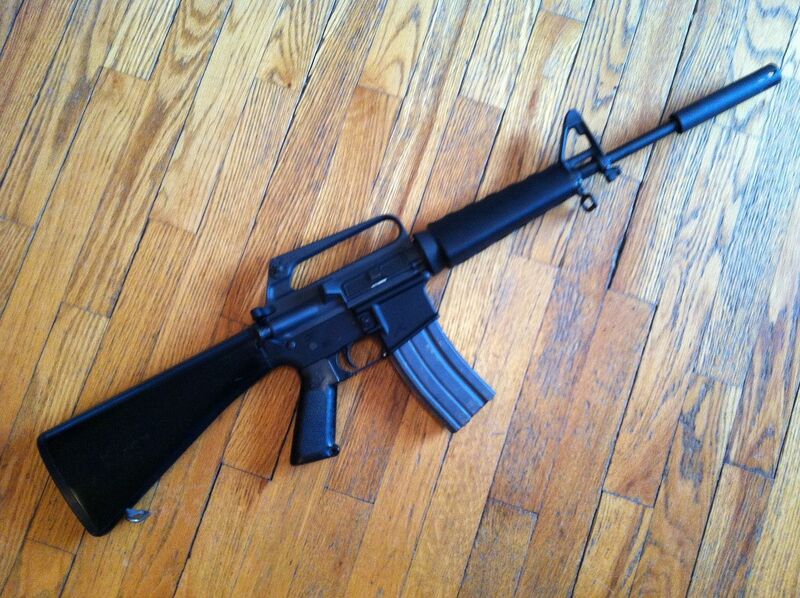 I searched my old pictures and found a Colt prototype carbine with triangle handguards. Last edited by Planning; 11-07-2018 at 11:51 AM.